Completion of the post-doctoral sports sciences residency will allow Dr. Karmali to practice as a sport specialist chiropractor and Fellow of the Royal College of Chiropractic Sports Sciences (Canada). This residency is the highest level of training for sports chiropractors and consists of over 1500 hours of field work, an academic focus on exercise physiology, sport nutrition, sport psychology, advanced imaging, and sport specific research, in addition to acute and chronic injury management. Since 2015, Dr. Karmali has been the Team Chiropractor for the Okotoks Oilers Junior A Hockey Club and provided medical services for the Canadian Junior Hockey League’s Top Prospects game in 2019. Dr. Karmali annually provides on site care for athletes participating in the Harvest Half Marathon and Stampede Road Race, utilizing various treatment protocols including Graston® and Active Release Techniques®. Dr. Karmali served with the medical services team at the 2019 Canada Games in Calgary and Red Deer and was the Sports Medicine Consultant to Team Canada at the 2016 Jubilee Games in Dubai. He also served as a medical staff member for Taekwondo Canada National Championships in 2016. A recognized Exercise is Medicine Canada (EIMC) professional. Dr. Karmali has previously worked as a Fitness Consultant at Nexen Inc. and as an Assistant Program Instructor for the University of Calgary’s Rehabilitation and Fitness Program for Persons with Disabilities. During his time at the University of Calgary, he gained a solid understanding of how various walking and running biomechanics can lead to injury at the Running Injury Clinic. 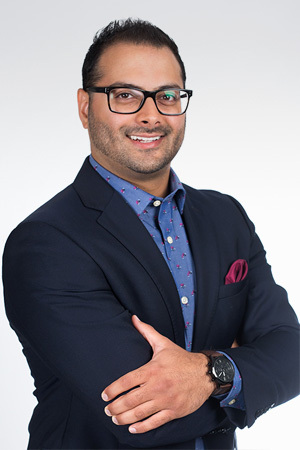 Dr. Karmali has been an admissions interview assessor for CMCC’s Doctor of Chiropractic program since 2014 and is a member of the RCCSS(C)’s National Sports Organizations Committee. He also holds a voluntary position as a Regional Board Member of the Aga Khan Youth and Sports Board for the Prairies: he oversees the operation of youth community ball hockey and soccer leagues in Calgary, as well as mentoring a youth executive team that facilitates social and educational programming for their peers, in addition to collaborating with other Boards on the shared mandate of Youth Development.